In this post, I will briefly mention SHFK and EVI, two of my favorite current holdings. I will then update NROM which had a very strong Q3 and discuss LVB which had a slightly disappointing Q3 announcement. I continue to really like this stock. While it basically does not move and it took me awhile to establish a position, it’s hard to imagine how you lose here. Trading at half of book value and 2.2X mid-cycle earnings and a flexible cost structure, this is a slam-dunk IMO. The fact that management bought back 57% of shares last year is incredibly beneficial to shareholders and shows what management thinks of the stock. They only file once/year, but I am expecting a very solid report out of SHFK around year-end. I found this idea originally from Shaun Noll who has been in the stock for a long time and knows it extremely well. I may do a full write-up on it later but here is the quick pitch from my perspective. The cheap valuation, simple business, and the fact that the company is paying a $0.60 special dividend on a ~$2.00 stock by the end of the year caught my attention. It’s a $15 mm stock that has over $10 mm in cash. The company is a distributor of laundry equipment to individual stores/ franchisees. It’s an extremely simple business that has had very stable financial results—even during the Financial Crisis. I estimate the company’s worst-case scenario run-rate net income (which in this case approximates FCF… insignificant capex/depreciation) at $500 K. Since the company is 60% insider owned and seems intent to return cash to shareholders (and themselves), I think valuing the company on an EV basis is appropriate (as market cap should move towards EV as mgt. returns cash). Therefore, even using worst-case earnings, the company trades at a better than 10% EV/FCF yield. Now, I wouldn’t buy the stock if I thought it would give me only 10% returns. I am just highlighting that even in a worst-case scenario, that’s a pretty solid yield for a stable, simple business and it gets me comfortable with the downside. The company had a record backlog last quarter and could make as much as $1.5 mm in net income in 2013. Under this scenario, the company could easily trade to ~4.00. I love heads I win big, tails I make 10% on a simple, stable business. I think the company is likely to post a big 2013 and management will attempt to buy out the whole company. Upfront franchisee fees and commissions were $311,022 compared to $185,491. This is important because it indicates that the non-traditional segment is still healthy, which is currently their most valuable business segment. 2012 YTD, they have already signed 411 additional grocery store take-n-bake locations. Conclusion: NROM is very much on track. Note that in my “Bull” scenario valuation of $1.67/share, that factors in about 400 grocery store signings/year and 35% margins. With a full quarter left in 2012, they are already at 411 stores signed and have higher operating margins. They also are showing progress on the stand-alone take-n-bake stores, which I decided to leave out of my model as pure upside (difficult to say predict how it will take-off). Management seems to be optimistic—and I have heard reports suggesting their new opening is going well. NROM is very much a developing story and the thesis is on track. I continue to patiently hold shares and think the next 12-18 months will be good ones for NROM shareholders. Back in September, I highlighted the Sum of the Parts value of Steinway Musical Instruments (LVB). I laid out my high and low estimates for fair value for all of their assets and deemed prices fairly valued to 87% undervalued. The company previously said they would announce the results of strategic alternatives by the end of Q3 (September). Well, on the latest conference call, there was mixed news. Good news: They announced an agreement to sell their West 57th Street property—monetizing a non core asset and showing the first tangible progress of the strategic review. Bad news: An unanticipated chunk of the value is going to the landowners, rather than Steinway (the building owner). Furthermore, the rest of the strategic process is taking longer than expected—leaving shareholders in the dark during an expensive process. From their conference call: As a reminder, Steinway owns the building on 57th Street subject to a long-term land lease. “The proposed transaction will be with us and the landowner as sellers. The total purchase price for the combined property is $195 million, with $56 million coming to Steinway. $20 million of the $56 million will be held in escrow until we vacate the space we currently occupy in the building. The letter of intent stipulates that 12-month advanced notice be given by either party with respect to vacating our space. How does this affect the investment? I originally valued LVB’s stake in the West 57th property at $50-$100 mm, so the $56 mm is near the low end of my valuation. This lowers the high valuation from $47 to $43, not a huge move. More concerning though is the delay in the strategic review process. At this point, management has overpromised and under-delivered—and it is clear investors are growing frustrated. With little transparency in such an important process and the West 57th street sale coming in near the low range, I am less bullish than I was before. While I still think the risk/reward is favorable, it is no longer as large of a position for me. Schuff International is cheap at less than half of book value, ugly as a cyclical and highly levered construction company, and a potential multi-bagger with the continued recovery in construction spending. While casual onlookers of the stock may view it as extremely risky— high debt load, big debt maturity in 2013, and a nano-cap with limited disclosure, this risk is misunderstood, creating an extraordinary cheap stock for current investors. The company’s management seems to agree—having retired over half of the shares in the past year at a huge discount to book value. I believe the stock is a great risk/reward at current levels and is conservatively worth ~$20, nearly a double from current prices. Schuff International is the largest steel fabricator/erector in the United States. For those unfamiliar with industry, this essentially means that they take steel and alter it to fit the needs of a particular construction project. This is a very fragmented industry because it is very costly to ship large amounts of extremely heavy steel, which is why a $45 mm mkt cap company can be the largest player in the U.S. Schuff operates in Arizona (company headquarters are in Phoenix), Florida, Georgia, Texas, Kansas, California and the New York City area. They typically are paid with a “cost-plus” model and do not have significant customer concentration risk with their largest customer representing 11% of sales in 2011 and no other customers over 10%. This business is very cyclical, but should be profitable throughout an entire cycle. For example, as recently as 2008, the company made over $97 mm in EBITDA, greater than twice their market cap, and $57 mm in net income. 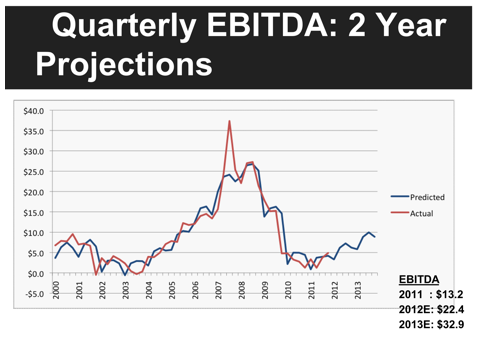 However, the 2008 crash really hurt construction and their latest annual EBITDA and net income is $13.2 mm and ($5 mm) respectively. With such a cyclical industry, investors have seemingly been scared by the company’s high debt load and sold the stock from its $35 high to just over $10, which represents half of book value. From “trough to trough” in the construction market (2003-2011, see chart below), the company’s average unlevered FCF was $20.48 mm, which makes the normalized FCF yield over 22%. Furthermore, the company’s costs are highly variable, which allows them to cut employees and close plants during tougher times in the construction market and thereby avoid disaster years. The company has not had a single year of negative EBIT since 1995 (as far as my data goes back). Key Takeaway: Schuff’s quarterly success is so cyclically-based that it is possible to predict their EBITDA using only “national” data suggesting their cyclicality is simply a product of the industry, which should snap back, rather than company specific downturns. 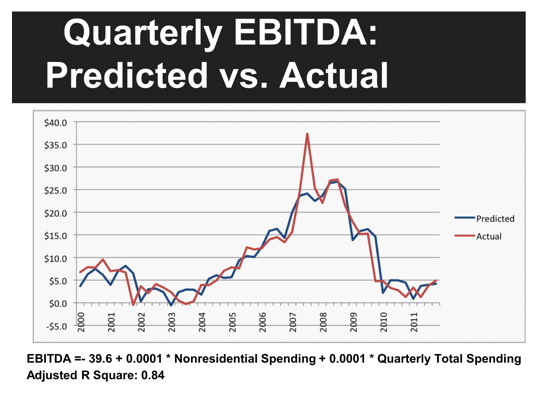 While SHFK has zero analysts covering the stock, is extremely illiquid, and does not offer annual guidance, one can use the model above to predict their EBITDA based on readily available estimates for national construction data. 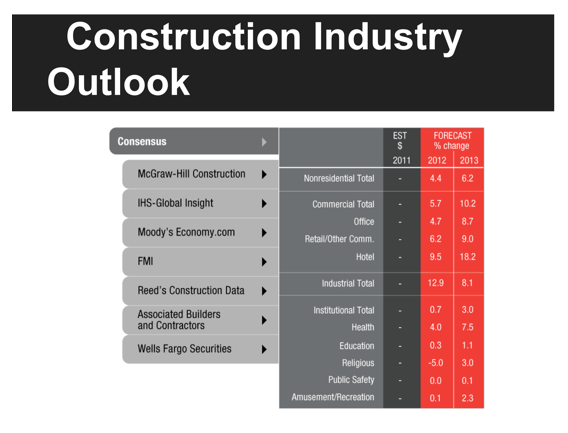 As seen below, analysts are predicting a strong rebound in Nonresidential construction growth in 2012 and 2013. Below, I include the same model, but it includes a two year projection for EBITDA based on the consensus estimates for national construction data. The company has nearly $56 mm in debt, which represents over 4X EBITDA. This is a large amount for a cyclical company, leading some people to believe bankruptcy is possible. First, realize that the debt repayment schedule is somewhat unusual given its lumpy nature. SHFK has over $7 mm in cash on the balance sheet and the EBITDA model predicts $22 mm and $32 mm in 2012 and 2013 respectively, which would be more than adequate to cover debt requirements. Perhaps even more importantly, the company’s revenue is also tied to a small number of contracts, giving the company much more visibility into future revenue than any investor, especially since the company only files results once per year. This is why it is so incredibly significant that the company took on MORE debt last year in order to retire 57% of their shares outstanding at less than book value! Why would management, which owns the majority of the stock, do this if they were worried about their interest payment one year from now? They would be sued, perhaps file bankruptcy, and have their family name and business tarnished. Finally, the company’s balance sheet should protect them from any downturn, making their debt load much less of a concern. Trading below tangible book value, with over $60 mm of that book value in land and buildings is pretty reasonable. Therefore, while the debt load is a risk and something to watch, everything I have examined suggests it is manageable. If this sell-off is unwarranted, how much are shares worth? -Note that 2003-2011 was chosen because it represents the last “cycle” from trough to trough (in chart above). Management interests may not be aligned with minority shareholders. The Schuff Family offered a lowball takeout price in 2006 that was rejected. Company is deeply undervalued at .4x book value, 2.2X mid-cycle earnings, and 4.5X EV/ Normalized FCF. Management, who is most knowledgeable about the financials, was incredibly aggressive using debt to buy-back stock at a large premium to the current price, indicating how undervalued they consider current shares.